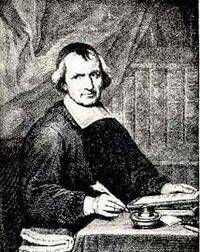 Antoine Arnauld, (1612 – August 8, 1694) was a French Roman Catholic theologian, philosopher, and mathematician. Though his primary interests were consistently theological, he acquired a reputation in his day as one of the greatest philosophical minds. His debates with three of the most prominent philosophers in western Europe (Descartes, Malebranche and Leibniz) attracted considerable attention, and did much to shape the course of modern philosophy. Though he was first known for his critique of it, Arnauld was an adamant defender of Cartesian philosophy in the days when Scholastic philosophy was dominant. He also became known as one of the most outspoken defenders of Jansenism. Today, scholars regard his criticisms of his contemporaries as some of the best of the time, and much of contemporary philosophy of perception has its roots in his attack on Malebranche. Antoine Arnauld was born in Paris on February 8, 1612. His family was a particularly important one in France, with various connections to the convent at Port-Royal (Arnauld's older sistent, Mère Angélique, had become the abbess in 1602). Arnauld's original aspiration was to become a lawyer, as his father had. Yet by 1633, Arnauld had decided to pursue theology instead. In 1640, he joined an informal group of intellectuals associated with the Port-Royal convent, whose ranks included Blaise Pascal and Pierre Nicole. That same year, he was asked to write a series of objections to a forthcoming work by René Descartes. These objections were published the following year as the Fourth Objections to Descartes' landmark Meditations. Arnauld's objections were particularly incisive, and he began to establish his reputation as one of the most powerful analytic minds of his day. In 1641, Arnauld was ordained a priest. Two years later, he was admitted to the faculty of the Sorbonne. That same year, he published De la fréquente communion, a critique of the Jesuits. This work remained influential in Catholic circles well into the 1800s. Also in 1641, Cornelius Jansen's Augustinus was published posthumously in Paris. The work became an immediate subject of attack by various Catholic officials. Arnauld was sympathetic to the work, and took a stand in its defense. In 1653, however, Pope Innocent the Tenth declared a set of five propositions heretical which Augustinus was believed to promote. Arnauld denied that the propositions adequately characterized the work, yet his views nevertheless resulted in his being expelled from the Sorbonne in 1656. In 1669, a compromise was reached, and Arnauld was able to resume working in piece. During this time, in conjunction with two other members of the Port-Royal group (Claude Lancelot and Pierre Nicole, respectively), he wrote the General and Rational Grammar and Logic or the Art of Thinking. Late in 1670s, tensions rose again in France, and Arnauld followed the example of Descartes in moving to the Netherlands. There, he continued his correspondence with various figures, and died peacefully in Liège on August 8, 1694. Arnauld's mark on the history of philosophy was primarily made via his interactions with three of the greatest rationalists of his time: Rene Descartes, Nicolas Malebranche and Gottfried Leibniz. Though his first notable work was his criticism of Descartes, he eventually became one of Descartes' most staunch defenders. Though more than capable of seeing to the heart of purely philosophical issues, Arnauld was first and foremost a theologian. His advocation of Cartesian philosophy stemmed from his belief that it best supported the tenets of the Catholic faith. Descartes' Meditations was published in 1641 along with six sets of objections and replies. Arnauld composed the fourth set of objections. His most famous objection to the Meditations is his description of what has come to be known as 'The Cartesian Circle.' Arnauld noticed that Descartes relied on what he termed 'clear and distinct perceptions' in reaching the premises in his arguments for the existence of God, then used the existence of God as a premise in his argument for the claim that all he clearly and distinctly perceived to be the case had to be true. Such a form of argument, however, was circular—each argument relied on a premise that could only be accepted if one already accepted the conclusion of that argument. Descartes' response was quite brief. He pointed Arnauld back to passages where he had noted the use of the proof of God with respect to the memory of things formerly clearly and distinctly perceived. Most, but not all, contemporary readers of Descartes have found this response thoroughly unsatisfactory. Arnauld also took issue with Descartes' certainty that there is nothing in the mind of which we are not aware. To shed doubt on this view, Arnauld cited the example of an infant in its mother's womb, who surely is so far unaware that she has the power to think. Relatedly, Arnauld found reason to question Descartes' proof of the distinctness of the mind and body, which was based on his having a clear and distinct perception of each without the other. If such a line of reasoning were sound, Arnauld argued, then it would likewise be reasonable for someone to argue that a triangle could be right-angled without having the square of its hypotenuse equal to the sum of the squares of its two sides (the Pythagorean Theorem). For someone without knowledge of the Theorem might well clearly understand the nature of a right triangle, and yet have that understanding without seeing that the Theorem applied to any such triangle. Arnauld also included a theological objection. In the Meditations, Descartes subtly provided the elements of a non-Aristotelian physics. On Descartes' view, the physical world could be explained entirely in terms of extension and motion. Such a view, Arnauld objected, undermined the then-established solution to the metaphysical puzzles of transubstantiation. Aristotelian metaphysics described the world in terms of matter and form, and Catholic theologians had made use of these notions in saying that, in the Eucharist, the bread retained the form of bread while becoming the matter of Christ's body. No such solution was available to Descartes, who shared Arnauld's desire for the new philosophy to remain consistent with Catholic doctrine. Arnauld was initially supportive of Malebranche's philosophy as presented in the latter's The Search After Truth (first published in 1674-75). Like Arnauld, Malebranche was a priest whose interest in philosophy was largely theologically motivated. Also like Arnauld, Malebranche drew heavily from the thought of Descartes and St. Augustine—indeed, both Malebranche and Arnauld came to be regarded as experts in the new Cartesian philosophy. Yet, by 1680, Arnauld had turned into a fierce critic of Malebranche, eventually publishing a book-length critique in 1683 (Des vraies et des fausses idées). The book focused on one of the more radical aspects of Malebranche's view—the so-called 'Vision in God.' Taking as his starting point Descartes' doctrine of clear and distinct perception, Malebranche argued that our clearest cognition consisted in our somehow coming to see ideas in God's own understanding. Though counter-intuitive, such a view explained how we could be certain that a certain portion of our cognition accurately reflected reality, since the ideas in God's understanding where the basis on which God created and governed the world. Arnauld understood Malebranche to be stating that, by our clear ideas, we perceive objects in the world only indirectly. That is, what we truly perceive are certain ideas of those objects, not the objects themselves. Arnauld found such a view repulsive—if true, it would mean that we are unable to truly perceive any of the things we take ourselves to perceive. The mistake, Arnauld claimed, was in mistaking the act of perception for the object of perception. In other words, on Arnauld's view, having an idea of some object just is perceiving that object. As an analogy: it would be a mistake to say that when a person 'has a go at singing' that what he's trying to do is go—rather, what he's trying to do is simply sing. Though the issue of Vision in God formed the centerpiece of Arnauld's criticism, he also found Malebranche's general picture of God's power unsatisfactory. According to Malebranche, God's rule of the world is primarily accomplished via 'general volitions,' understood roughly as the laws of nature. At the same time, Malebranche allowed that God could in some sense desire certain things (e.g. that all people be saved) without the object of that desire coming about. Such a view, Arnauld worried, made God both too distant from creation to be a proper object of worship, and too weak to be truly understood as omnipotent. In the mid-1680's, Leibniz sent Arnauld an early and partial draft of what would become his Discourse on metaphysics. Arnauld was a well-respected figure by this time, while Leibniz was only at the start of his mature philosophy. The suggestion which most caught Arnauld's attention was an aspect of Leibniz's view of Pre-Established Harmony. According to this view, all substances, from creation, contained in some form all the properties they would ever have. The universe thus consisted of a variety of pre-determined and non-interacting substances, whose apparent interaction was only the result of God's coordination. The complete history of any particular substance was therefore established from the moment it came into being. Not only did Arnauld see this view as threatening any truth in human freedom, but he also saw it as unacceptably limiting God's power. For, once God had created a particular substance, it would seem that God was then powerless to intervene. After creation, then, God becomes largely powerless—Leibniz did contend that God was needed to support the existence of substances after creation, but this was far from the sort of omnipotence Arnauld believed was needed. Oeuvres de Messire Antoine Arnauld (42 volumes), Èditions Culture et Civilisation (Brussels), 1964-67. Originally Lausanne (Paris), 1775-1781. On True and False Ideas, Elmar J. Kremer (trans. and ed.) New York: Edwin Mellen Press, 1990. (with Claude Lancelot) General and Rational Grammar, Jacques Rieux and Bernard E. Rollin (trans. and eds.) The Hague: Mouton, 1975. (with Pierre Nicole) Logic or the Art of Thinking, Jill Vance Buroker (trans. and ed.) Cambridge: Cambridge University Press, 1996. (with Leibniz) The Leibniz-Arnauld Correspondence, H. T. Mason (trans. and ed.) Manchester: Manchester University Press, 1967. Moreau, Denis. Deux Cartésians, La Polémique entre Antoine Arnauld et Nicolas Malebranche. Librairie Philosophique Paris: J. Vrin, 1999. Nadler, Steven. Arnauld and the Cartesian Philosophy of Ideas. V: Princeton: Princeton University Press, 1989. Ndiaye, A. R. La Philosophie d'Antoine Arnauld. Librairie Philosophique Paris: J. Vrin, 1991. Sleigh, R. C., Jr. Leibniz & Arnauld, A Commentary on their Correspondence. New Haven: Yale University Press, 1990. This page was last modified on 6 April 2016, at 19:45.